"From ghoulies and ghosties/And long-legged beasties/And things that go bump in the night,/Good Lord, deliver us!" (Scottish prayer) Welcome to the October edition of The Book Review Club! Please be sure to scroll down after my review. There are links to reviews of good books in a variety of genres (more adult fiction than usual this month). Enjoy! 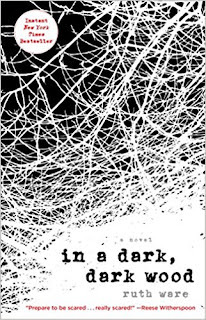 Because I figure you'll hear about them from other sources, I don't often review books that hit the NYT bestseller list (In a Dark, Dark Wood was a NYT, USA Today, LAT bestseller and more. Plus Reese Witherspoon's developing it as a movie.). 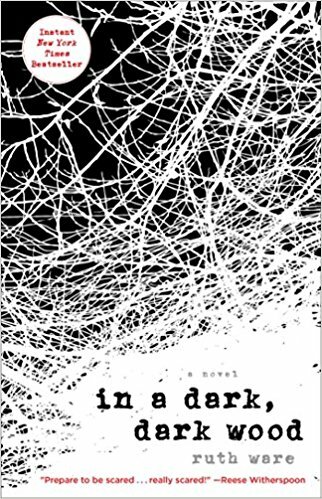 BUT a psychological thriller makes for a great Halloween month review. AND this book kept me on the elliptical way, way past 30 minutes! WHICH MEANS In a Dark, Dark Wood totally grabbed me. In a Nutshell: Six twenty-somethings celebrate a bachelorette weekend in a remote house in Northumberland, England. Some of the characters know each other. Some are meeting for the first time. The house is creepy and surrounded by a forest (hence, the title :) and has sketchy cell phone service. Voila! You have all the ingredients for a thriller. So What? : But what makes this story stand out? Believe me, I don't stay, huffing and puffing, on the elliptical for any old thriller. Two things, I think. Number one is the characters. They are so very multi-dimensional. For example, the protagonist, Leonora Shaw (who goes by several names, depending on the stage of her life) is a runner. Which is handy in a thriller. A runner can run away from the bad guy. But more than that, Leonora has the loner mentality of a runner. And it's that loner mentality that directs how she reacts, how she makes decisions, how she interprets information. And all these things drive the plot. Number two is the moving parts. There are a lot of them. And they are handled expertly and fit together perfectly. Leonora Shaw is our point-of-view character. The story begins with her receiving an invitation to the bachelorette weekend. Fairly early on, though, Leonora wakes up in a hospital room, trying to remember how she got there. From this point, the author is juggling two time lines (before the murder and after the murder). I can imagine Ms. Ware sitting with a cup of tea, thinking and planning and scheming to make sure there are no loose threads and no clunky plotting. Much appreciated! I listened to In a Dark, Dark Wood. Imogene Church is a terrific narrator. Also, I enjoyed all the British-isms in this book, such as "hen" party in lieu of "bachelorette." Ruth Ware's most recent publication, also a psychological thriller, is The Lying Game (July 2017). It's certainly on my list!